As a 1953 follow-on to the 1950 Destination Moon (see also), this work is interesting in that it features the va-va-va-voom Donna Martell as Heinlein's typically strong but ultimately submissive female lead. Not necessarily bad unless you're a feminist, I guess; still she, like other Heinlein heroines, comes across sharp as a tack compared to the rather obtuse hammer-sack jocks she's compelled to work with. The paternal commander played by Hayden Rorke (aka Dr. Bellows in I Dream of Jeannie) is obviously a stand-in for Heinlein himself -- think of SiaSL's Jubal Harshaw in uniform -- who bizarrely shows his kink in threatening to spank his unruly female subordinate. Definitely creepy. Fun to watch, but only because it is fantastically bad. Okay, this has got to be among the top two silliest 50s science fiction movies I've ever seen! Does that mean I don't like it? No. I really like it. I just think it's super-silly, and that's what makes it fun. And heck, I, for one, think Ms. Breiteis (pronounced Bright Eyes) is really cute. This is one credit Hayden Rorke probably wished wasn't on his resume', though. Wait 'til you see the get-up he gets to wear! Still, although this doesn't even approach the top-knotch writing, directing, and acting of the best of the 50s sci-fi flicks (and there were quite a few good ones), it's an enjoyable nostalgia piece. The video transfer is super-crisp. I mean, the original print must have been hermetically sealed (did I spell that right?) and sitting in an air-tight jar on Funk and Wagnall's climate-controlled front porch since the late 50s. Audio and video are excellent. There's nothing silly about the technical aspects of this DVD -- which is a whole lot more than can be said for the plot (and the directing, and the acting, and ...). An expedition sets out in 1970 to orbit and survey the Moon while setting a foundation for future U.S. missions. But a mechanical problem forces the craft to land on the Moon's surface and the race is on to solve several mysteries - that includes espionage and plans in the Soviet Union to derail the U.S. project - while rescuing the astronauts. Author Robert A. Heinlein co-wrote the screenplay (based on a story he penned), with the "film" - edited pieces of an unsold Sci-Fi television series, Ring Around the Moon - being released in 1953. Directed by Richard Talmadge, it features women in a variety of top leadership positions - on the mission and in politics - while exploring the possibilities of space travel in a realistic manner. Somehow this movie never played on TV in my locale (Milwaukee/Chicago) when I was a horror-crazed kid (unlike apparently every other cheap SF flick of the period). For fans of low-budget 1950s space operas this is a terrific find. 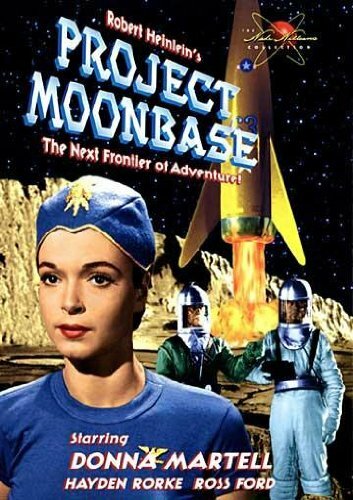 Project Moonbase neatly straddles the fence between "serious" science-fact specimens such as Destination Moon or Riders to the Stars and tacky "babes in space" fare like Cat Women of the Moon or Queen of Outer Space. It shares a similar look and feel with all those films and other typical titles of the era from Astor, Allied Artists, UA, and other independents, such as Missile to the Moon, Fire Maidens of Outer Space, War of the Satellites, etc. Co-written by pioneering modern SF icon Robert Heinlein (Destination Moon, The Puppet Masters, Starship Troopers) and low-budget western producer Jack Seaman, PM contains enough sober "speculative fiction"/rocketry tech stuff to satisfy hardware geeks as well as plenty of cool atomic-age design and forehead-slap-inducing sexism ("I ought to turn you over my knee and spank you") for irony-wallowing bad cinema fanatics. `Genre' names peppering the credits include director Richard Talmadge (the silent movie star, stunt man, and 2nd unit director); Ed Wood's house cinematographer, William C. Thompson, and makeup man, Harry Thomas (unfortunately no one gets their face burned off with acid in this); former Columbia art director Jerome Pycha (Riders to the Stars, Unknown Island, Prehistoric Women), and future director (Cry Baby Killer, Twilight Zone, Lost in Space) Justus Addiss. The year is 1970, the United States has a floating space platform, and the government is about to embark on exploration of the moon. The Russkies, who look and sound like Midwestern businessmen, find out, and decide to sabotage the operation by commandeering one of our spaceships and crashing it into the space station. To accomplish this, they infiltrate the mission with one of their 350 (!!) Exact Doubles of Prominent Scientists that they just happen to have lying around. After some talky explanations of gravitational principles by General "Pappy" Greene (Hayden Rorke, I Dream of Jeannie's Dr. Bellows), Major Bill Moore (Ross Ford), and Colonel Briteis (pronounced "bright-eyes," cringe now) played by Donna Martell (Rocky Jones: Space Ranger) are selected, along with the doubled Dr. Wernher, for the mission to observe the dark side of the moon, much to their mutual consternation. See, Maj. Moore and Col. Briteis used to be an item . . . . During these set-up scenes it seems like you're in for one of those dry Gog type of flicks, but hang in there, things start to pick up once the space flight gets underway. For some reason they scream and sweat profusely on takeoff (?! ), and they all wear easily the silliest uniforms ever seen, comprised of tee shirts, short shorts, big honking belt buckles, and demure felt aviators' caps, which look cute on Ms. Martell but laughable on everyone else. Once they arrive at the space station we get a docking-with-the-space-wheel sequence, crazily angled sets, some (intentionally?) hilarious scenes of crewmembers matter-of-factly walking on ceilings and sitting on walls, and "please don't walk on the walls" signs posted in the corridors. (These scenes are strangely prescient of Kubrick's 2001: A Space Odyssey; could this be one of the dozens of SF flicks he screened while preparing his masterpiece?). Bill, Col. Briteis, and the fake Dr. Wernher take off from the station on the observation mission, Bill suspects Dr. Wernher's true identity (he's unfamiliar with the Brooklyn Dodgers! ), they're eventually forced to ditch their craft on the Moon, and Bill and Wernher go EVA to set up a communications relay. Throughout all this we get lots of nicely realized spaceship and moonscape sequences, conceptually on par or better than anything in a comparably-budgeted movie, forgiving a few laughably obvious gaffes. I also love how it appears that people on the ship's view screen seem to be simply sitting behind a hole in the wall, and late-night TV junkies will fondly nostalgia-trip on the B&W "target" test pattern they occasionally display. It all climaxes (spoiler alert) with an incredible only-in-the-50s "family values" denouement wherein the downed craft is proclaimed Moonbase #1; the now-clinching Bill and Briteis are "ordered" to get married by Dr. Bellows, er, General Greene since they'll be cohabiting on the Moon until a rescue mission can be mounted; the president of the United States turns out to be a woman (!! ); and Maj. Moore jumps Col. Briteis just as the closing titles fill the screen. While not as patently ludicrous as Cat Women, Fire Maidens, or Queen of Outer Space, Project Moonbase is similarly bent in its own unique way, and easily as entertaining (the 63 minutes fly by). Fans of cheap B&W 50s space epics cannot fail to be entertained. Highly recommended. the "gravitometer" -- so sensitive it even measures gravity during weightlessness! Don't miss this (unless watching one's diet concerning cholesterol-rich cheese) or "God" will be angry!